In order for a dentist to be considered an orthodontist, he or she must have completed two to three years of post-graduate training after dental school. Dr. Noah is not a Glenpool orthodontist. Although, he truly enjoys helping patients with crooked or misaligned teeth. He has pursued additional training in orthodontics and offers many solutions to straighten your teeth. If you are looking for a Glenpool orthodontist for your child or teenager, braces may be the right option. This method works well for this age group since the teeth have not fully erupted into the mouth. 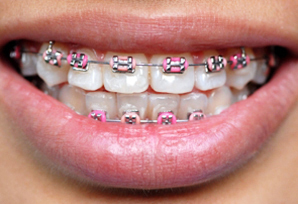 The metal wire and bracket system uses bands that apply pressure to gradually reposition the teeth. Multi-colored bands, as shown in the image to the right, are a great way for your child to express their personality. On average, traditional braces will correct the alignment of teeth in approximately 18-24 months. You’re not alone if you aren’t that excited about having to wear traditional metal braces. They take a long time and can be uncomfortable. Although, they are the best solution for individuals between the ages of 11 and 18, Invisalign invisible braces are a great option for adults. Invisalign uses clear plastic aligners to straighten your teeth in about half the time of conventional braces. Not only are they more comfortable than braces, they are invisible. No one will be able to tell you are wearing them. To learn more about this option, please visit our Invisalign page. If you are considering orthodontics, we encourage you to schedule a complimentary consultation. During this time, Dr. Noah will sit down with you and help you to determine what is best for your specific case. Give us a call at (918) 321-2000. Our orthodontic services are handled at our Glenpool location.